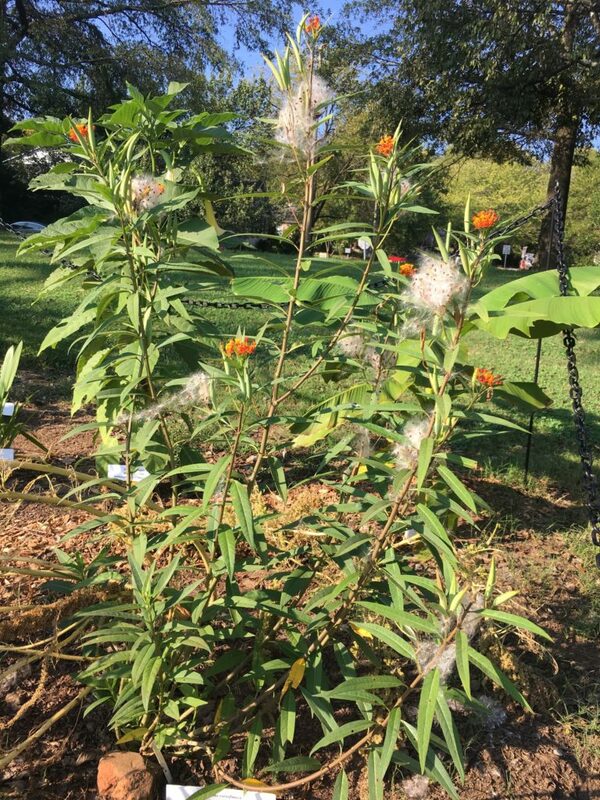 The Mexican Milkweed is an invasive perennial, spindly plant that grows between twoand three feet, commonly referred to as the bloodflower. When blooming, from June to October, the flowers are a reddish orange or yellow. This flowering period is much longer than the perennial milkweeds that are winter hardy. The leaves, green sometimes with white midribs, are used as a food source for the Monarch butterfly larvae. Monarchs instinctually lay their eggs on the milkweed plant. Not only are butterflies attracted to this plant, but also hummingbirds, moths, and bees. Most milkweeds, including the Mexican Milkweed, have a milky white sap that contains toxins that the caterpillars consume and isolate. The caterpillars retain this toxicity after metamorphose as a defense mechanism. The genus name Asclepiasis derived from the Greek God of healing, Asklepios, reflecting the medicinal qualities of the plants in said genus. The name milkweed comes from the white sap in the stems that is used medicinally, because the sap contains steroids called cardenolides, which exhibit cardiotonic properties, meaning it stimulates the heart. This sap is applied directly to warts and corns in order to kill them in Costa Rica. A syrup made from the juice of the Mexican Milkweed is a powerful vermifuge and laxative, meaning that this plant has antiparasitic qualities and can be used in the treatment of parasitic worms. In Jamaica, a decoction of the roots is made to treat dysentery, ringworm, bleeding and to serve as an eyewash for infected eyes because the root contains emetic and purgative compounds. Skin ulcers are treated by a paste made from the crushed leaves. This plant is also considered a cicatrizant, meaning that it heals cuts by encouraging the formation of scars. In Guyana, just the leaves are made into a paste combined with salt, vegetable oil, and bread to treat skin ulcers. In Indonesia, A. curassavica has been used to treat pneumonia, pyoderma, and inflammation of the spleen. Native Americans, in the 1880’s, used this plant as a contraceptive and snakebite remedy. The Ayurvedic healing system of India also uses this plant for its purgative effects to help stomach tumors, stomach parasites, and gonorrhea. This plant is also used in a less medicinal setting as poison in Brazil. Asclepias curassavica hosts Ophryocystis elektroscirrha, a parasite that infects and kills monarch butterflies. The continued breeding of this plant has exacerbated this parasitic infection and decreased the Monarch butterfly population. Another issue with the continued breeding of this plant is that Monarchs are not finishing fall migration because milkweed is now available year round. The OE infected monarchs are typically too sick to make the migration, but now with no need to migrate, this parasite can be passed onto offspring. When Monarch butterflies migrate, the infected plants die off. Without migration, the Monarch butterflies do not have a chance to leave behind infected milkweed, and thus more butterflies become sick and die. “Butterfly Garden Plant Asclepias curassavica Tropical Milkweed.” North American Butterfly Association, NABA, 4 Mar. 2014, nababutterfly.com/tropical-milkweed/. “Asclepias curassavica (Bloodflower).” Cabi, 22 Nov. 2017, www.cabi.org/isc/datasheet/7248. “Asclepias curassavica.” Missouri Botanical Gardens, www.missouribotanicalgarden.org.